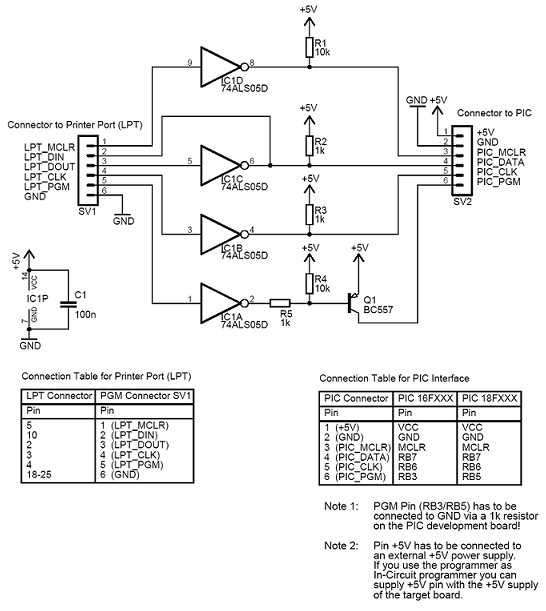 PICPgm supports all kind of serial port programmers as well as parallel port programmers. Also an USB Programmer using FTDI USB chip is supported. The most popular PIC programmers (e.g. JDM, Tait, Microchip AN589 programmer, ...) are pre-configured and will be automatically detected by the software. In the table below, you will find a list of all natively supported programmers. But this are not all programmers which can be used with PICPgm. As mentioned earlier, it supports nearly all serial and parallel port programmers. This is possible because PICPgm offers a feature to configure the programmer pins via the graphical user interface directly by the user. You can find this configuration in the menu bar of PICPgm: Hardware => Hardware Selection/Configuration. PICPgm LVISP is a Low-Voltgage, In-System Programmer. It is conneteced to the PC via the parallel port (LPT port). Note: The +5V supply for the programmer is take from the target board (via +5V pin on the programmer cable), i.e. the target board has to be powered to allow programming. 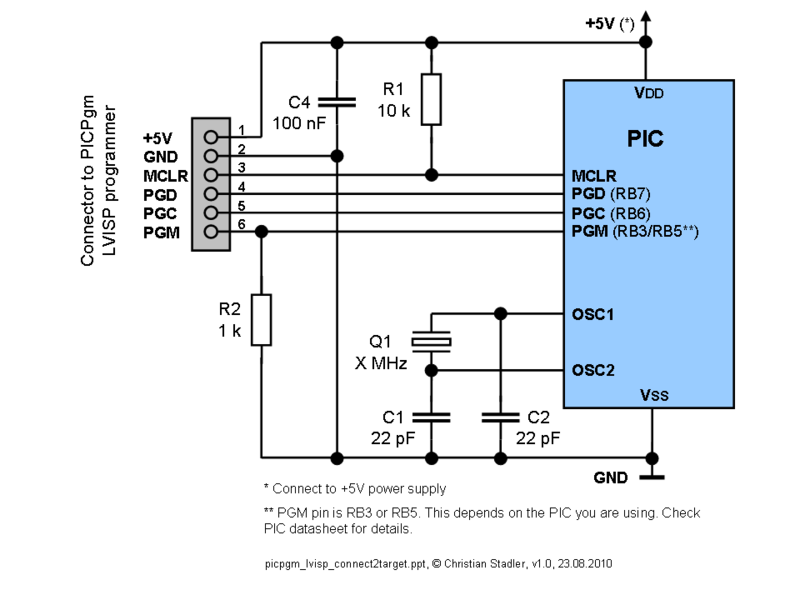 This programmer supports all PIC microcontrollers which are marked with a "yes" in the column "Low-Voltage programmable" in the supported PICs table. To be able to use the LVISP progammer, the following minimum PIC circuit is necessary on your target board. Please not that the PGM pin of the PIC cannot be used in case Low-Voltage programming is used. This pin must always be tied to GND for proper operation! 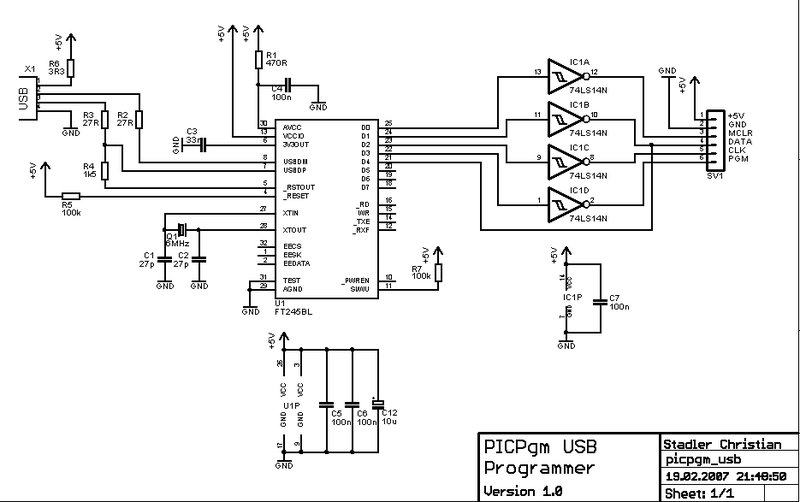 The PICPgm USB Programmer is a Low-Voltgage, In-System Programmer. It uses a FT245BL chip from FTDI. This chip provides a Parallel IO port via USB. The PICPgm Software uses the Bit Bang Mode feature of the FT245BL to contol the PIC programming pins. To use this programmer, you have to install the D2XX driver which is provided by FTDI. It can be downloaded at http://www.ftdichip.com/FTDrivers.htm. 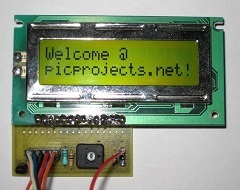 This programmer allows programming of PICs with PCs which have no parallel port or serial port. 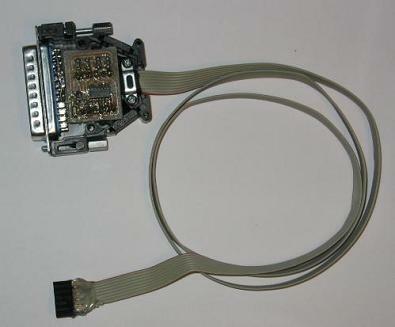 Unfortunately, due to the limitations of the USB bus, read operations from the PIC are very slow with this programmer. So I would suggest to use this programmer only to program a bootloader into the PIC. Further programming can be done after that via the bootloader which might be much faster. The Microchip AN589 Programmer is a High-Voltage Programmer. It is connected to the PC via the parallel port (LPT port). 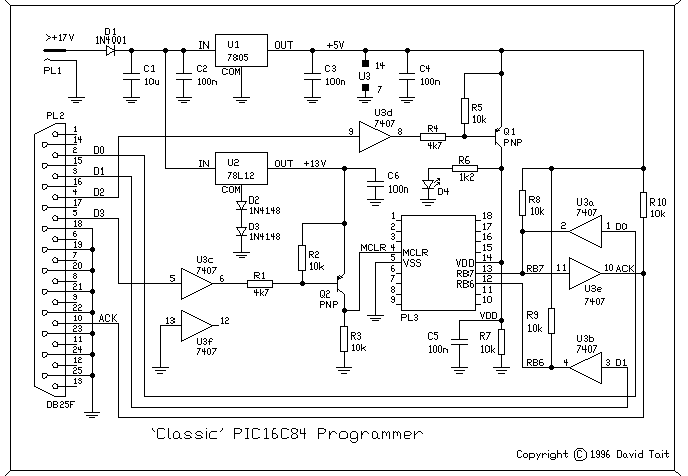 This programmer has been designed by Microchip as a low cost programmer for the PIC16C84. Nevertheless, it also supports all PICs which can be programmed in High-Voltage mode. All details regarding this programmer can be found in Application Note AN589 from Microchip. Note: If link is not working, just google for "AN589". This programmer supports all PICs which can be programmed in High-Voltage mode. For a list of all PICs supported by PICPgm Software can be found here. The Tait Classic PIC Programmer was designed by David Tait. It is a High-Voltage Programmer which is connected to the PC via the parallel port (LPT port). The JDM Programmer is a High-Voltage Programmer which is connected to the serial port (COM port) of the PC. It takes the programming voltage directly from the PC's COM port, so no separate power supply is needed. Due to the reason that the power supply is taken from the COM-port, for "weak" COM ports (especially in Notebooks) this could be a problem. So in this case the COM port could not provide a sufficent programming voltage and programming will fail. Please note that this programmer will not work with a USB-to-Serial adapter. Note: To allow programming of PIC 12F629 / 12F675 / ... it is necessary to modify the original JDM programmer as shown in the schematic above. This modification allows VCC control which is necessary for this PICs. PIC-PG2 is programmer based on JDM design which takes all necessary signals and power supply from RS232 serial port. 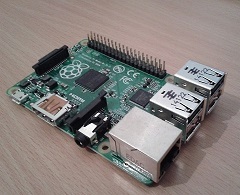 It supports 8, 18, 28 and 40 pin PIC microcontrollers. You can get a fully assembled and tested PIC-PG3 programmer at http://www.olimex.com. Schmatics and further details can be found at http://www.olimex.com/dev/pic-pg2.html. Note: PICs which need VCC contol (like 12F629 / 12F675 / ...) might not work with this programmer. Read more regarding this problem at the JDM Programmer. For this programmer the programmer autodetection feature has to be deactivated (Menu: Hardware - Hardware Selection/Configuration...) by directly selecting the Olimex PIC-PG3 programmer. Reason for this is that this programmer has overlapping MCLR pins depending on the IC sockets which could cause Vpp on a PIC port pin different than MCLR pin. Due to that also the corresponding Olimex PIC-PG3 programmer type has to be selected. I.e. if you want to program a 8, 14 or 18 pin PIC, you have to select the "Olimex PIC-PG3 (8pin, 14pin, 18pin)" programmer. To program a 28 or 40 pin PIC you have to select "Olimex PIC-PG3 (28pin, 40pin)". To program a 8, 14 or 18 pin PIC, you have to select the "Olimex PIC-PG3 (8pin, 14pin, 18pin)" programmer in the Hardware settings. To program a 28 or 40 pin PIC, you have to select the "Olimex PIC-PG3 (28pin, 40pin)" programmer in the Hardware settings. Get info regarding this programmer at http://www.rentron.com/Myke4.htm. Get info regarding this programmer at http://www.finitesite.com/d3jsys/. 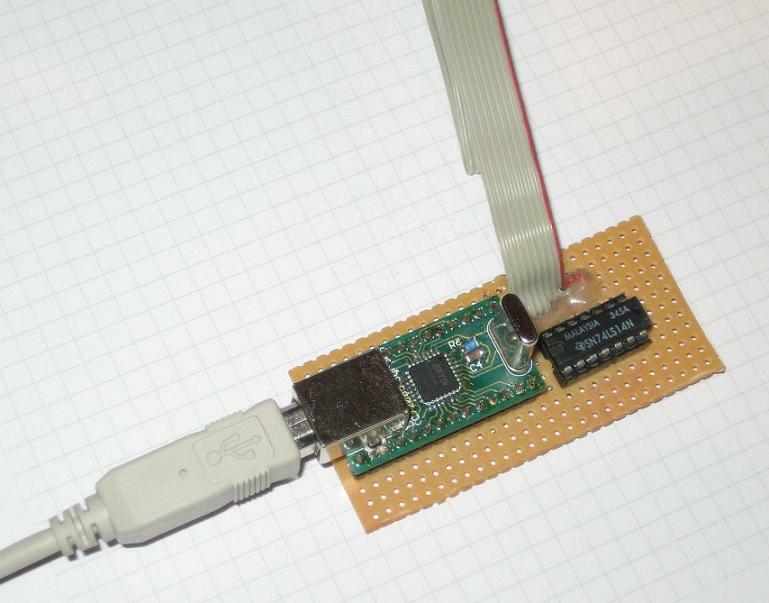 5PIP programmer, a simple serial port programmer with only 5 components (3 resistors and 2 diods): http://www.franksteinberg.de/5PiP.htm.